One of the things I commented on, when I turned in my observations about the Ale Fest, was the lack of food vendors. I have never seen beer as being something consumed alone. Beer is best when it goes with things. Even meeting someone for a beer generally results in the bar having some sort of snack available. So, I was very disappointed with the food offerings at the Fest. It was quite humorous to see people with pretzel necklaces, a string on which were threaded a lot of pretzels. Obviously, they had done this before. I had a hearty breakfast, my usual Saturday oatmeal, but by noon, I was ready for something. The trouble is, the pickings were not very good. A chocolate shop had a guy with a cart and he was selling popsicles and ice cream sandwiches. The ticket-mentioned sausage and cheese tasting was nowhere to be seen. There was a restaurant selling skewers, a tent with sausages, a guy with cinnamon sugared nuts and a guy, way down at the far end, with one of those vans with the kitchen in it. He was selling sandwiches. Come on. Beer deserves hot dogs, sausage, pizza, chicken wings, giant soft pretzels, and sandwiches of roasted chicken breast, hamburgers, cheeseburgers and thin sliced ham piled high on a sourdough roll. I realize this is the first year, so I will cut them some slack but I hope they recitify this next year. They had a lot of the tall tables out so there were places to stand, drink and eat. I wasn't sure what I wanted but I wanted something. There was a gal walking around the grounds who was acting as an ambassador for the Downtown Business Association. She told people, "Go to the yogurt shop and tell them they have the best yogurt. You get 15% off." Frozen yogurt and beer? Not a great combination but I was really hungry. I rinsed out my glass, drank half a glass of water and went to the yogurt shop. 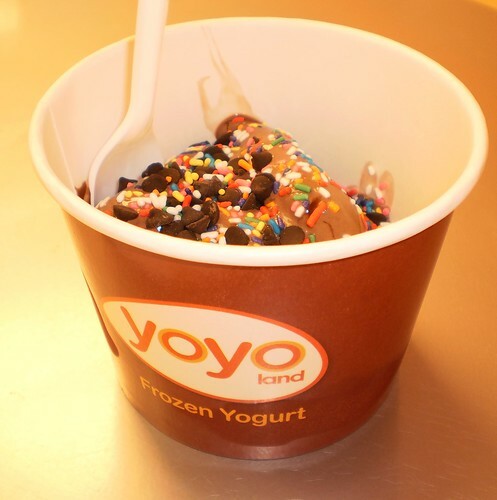 Chocolate frozen yogurt covered with chocolate chips and sprinkles. It was also air conditioned in the shop and it felt good to get off my feet in some place cool. I savored the coolness of the shop and watched as a 3 people came in feeling overwhelmed by the heat and humidity. That's when I realized they didn't have a cooling center set up and they really needed to. Again, this is the first time for this so I hope that's an idea they adopt for next year. I went back out into the festival and had a couple more beers. I was still hungry for something that really went with beer so I stopped at the sausage tent. 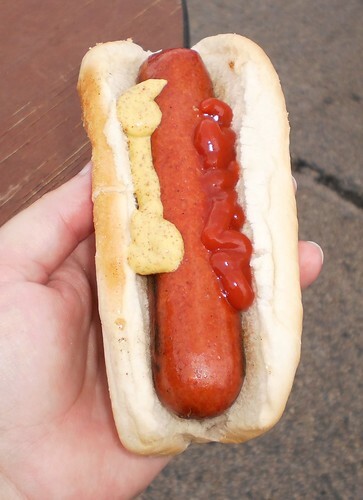 It's a simple hot dog. They had a bratwurst with onion and peppers. I love brats but with spicy mustard. They had another sausage that was made with chipotle peppers and a couple of other things that didn't appeal to me. There was nothing, other than this hot dog, that was simple. I thought back to all the times I've gone to a baseball game. Beer, hot dogs, pizza, pretzels and brats; simple brats, made without additional flavors, nothing "designer" about it. That's what I wanted. The sandwich truck at the far end had steakburgers, slabs of meat between bread. I wanted to say, "The food does not need to compete with the beers. Can't we have plain?" I felt sorry for those people who signed up as Designated Drivers. While they got a discount on their ticket and got a separate bag of goodies, the food available to them wasn't stellar. I hope there is more of a selection next year.